Titan Poker is one of the world’s best online poker rooms available in the industry and is on the iPoker Network. Established in 2005, Titan Poker is licensed by the governing laws of Gibraltar and accepts players from all over the globe, excluding the United States. Speed Hold’em is the latest innovation launched at Titan Poker, which also recently introduced an improved rewards program that specifically benefits recreational players. Titan Poker offers a 6-tier VIP program – Bronze, Copper, Silver, Gold, Titanium and Diamond. The VIP level increases as you accumulate Points at ring games and tournaments and the points can be exchanged for cash bonuses or used as buy-ins in tournaments. The maximum VIP rewards % for high volume players is 48%. Automatic monthly exchange of player points into cash rewards. Optimized benefit levels in VIP Club. Tournaments, freerolls and competitions by VIP level. Daily upgrades for deserving players. Casual online poker players, who previously didn’t receive benefits and promotions usually reserved for serious VIP players, will be the first to benefit with Monthly Cash. But now all players, no matter their VIP level, will enjoy the benefits of Titan Poker’s VIP Club. 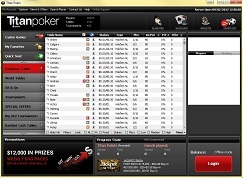 Titan Poker is available in both a download client and flash (instant play online) version. The download version is only available for Windows users. Titan Poker has vastly improved its poker action with the recent launch of Speed Hold’em Poker. In Speed Hold’em, players join a large pool of players and face new opponents with each hand. 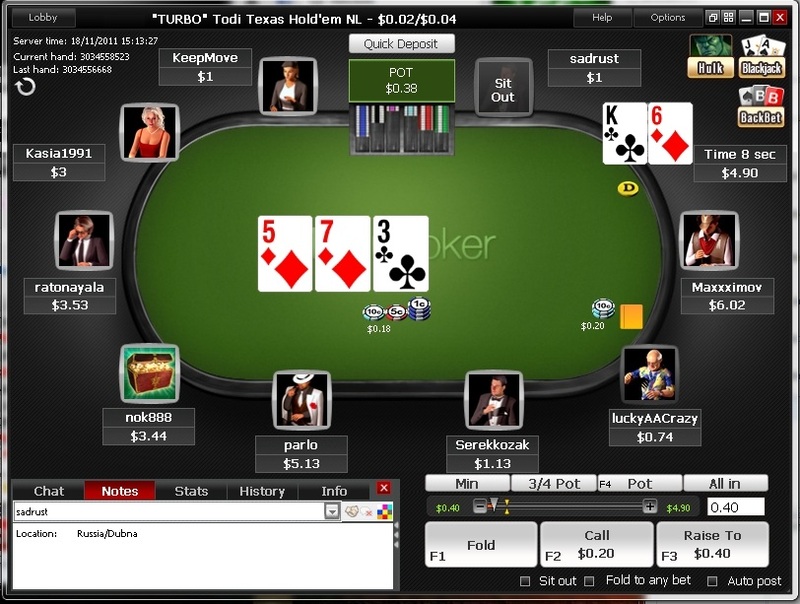 Players can fold whenever they like and are immediately moved to a new table where they are dealt new cards. As compared to other varieties of speed poker currently on the market, players play more poker per hour and enjoy the quick pace and seamless table changes at Titan Poker. Players can rediscover the fun side of poker with Titan Treasures, the fun promotion that distributes rewards based on poker achievements. Skill in the game is not a pre-requisite as players are rewarded with virtual Gold Coins for accomplishments that include winning hands with full houses and finishing in the money at sit ‘n’ go tournaments. Gold Coins can be traded for valuable Titan Treasures that are sure to please. Titan Poker and the iPoker Network is currently the second largest poker network in the world when comparing total players, but that fluctuates week to week with Party Poker, 888 Poker and Full Tilt Poker. Titan Poker and the iPoker Network features over 25,000 players in the lobby during peak hours with over 7000 playing at cash games. The majority of Titan Poker’s traffic will be at No Limit Texas Hold’em, but Limit Hold’em and Pot Limit Omaha players will not have a problem finding any good tables. Titan Poker offers a wide variety of tournaments including: New Depositors freerolls, $3,000 Beginners Race, Lord of the Grind, MTT Challenge, Sit ‘Win’ Go, Super Sale, $10,000 Monthly Bonanza, Irish Open 2012, $200,000 Guaranteed Freezeout, $60,000 Guaranteed, $40,000 Guaranteed, Titan Double Challenge, $5,000 Gladiators Race, Weekly Depositors Freerolls and many more. Titan Poker guarantees millions in monthly tournament prizes. Scheduled tournament activity includes the popular $200,000 Guaranteed freeze out event on Sunday evenings. Entries to major poker tournaments around the world are up for grabs at ongoing qualifier satellite series. Specially designated jackpot sit ‘n’ go tournaments give players an opportunity to win progressive jackpot prizes as high as $300,000. New players will receive a Titan Poker deposit bonus of 200% up to $2,000 which expires in 60 days. The bonus is released in increments of $5 for every 250 Points earned, for a rewards rate of 34.0%. We feel this is one of the best deposit bonuses currently for all poker players and provides not only significant rewards but also a high dollar amount and long expiration period. In addition to the deposit bonus, new players at Titan Poker will receive 4 entry tokens to the $2,500 New Depositors Freeroll as well as the VIP cashback as we described above. Titan Poker offers award winning customer support via live chat, email, and phone 24 hours a day and 7 days a week. Its telephonic support is available as international and toll-free Canada and UK. Titan Poker has support in 11 languages and players have easy access to support via the live chat module. Banking Options: Visa, Master Card, MoneyBookers, Insta Debit, EntroPay, UKash, Neteller, Click2Pay, Click And Buy, EcoCard, Eps, Webmoney, TrustPay. Titan Poker was the recipient of the 2012 Gambling Readers’ Choice Award for Best Poker Customer Service. Player accounts can be funded safely and securely with a wide range of available payment methods. Titan Poker’s professional and friendly support staff is always ready to assist by email, phone, or via online chat in the poker software. Because of the generous welcome bonus of up to $2,000, Titan Poker is a perfect place to play to earn free bonus cash. Titan Poker has a ton of traffic and a great support team; two qualities that highlight the professionalism that Titan Poker brings to the industry.